Someone very recently proposed (oh, how clever) the idea of a sticky-topic proposal thread. So, let's make this it! Please come here to post any single proposal story (your own or otherwise) or idea, and keep commenting to a minimum so we don't clutter up the thing. Sound good? Once we get it going we can ask Andrey to sticky-it! So, give us your proposal stories/ideas! My girlfriend and I have been together for three and a half years, two of those were long distance, and we have now lived together for 8 months. I had planned to propose in early December. Since we first decided to move in together she has been begging for a real Christmas tree. We live in a one bedroom apartment in Boston, so I have been telling her that we can get a small decorative one, but nothing over 3 feet. Sadly a month ago she found the ornaments hiding in a suitcase in our storage closet, and was able to guess the proposal, so that idea is off. Hope this helps someone else. Mine: BF planned a trip, but wouldn''t tell me where it was. He told me to pack for warm AND cold. We went to the airport and he told every single ticket agent, gate agent and customs agent not to tell me and nobody did I had headphones on during any announcement. When we were about an hour from Paris I knew we were going to France because I noticed a few people on the plane speaking French. When we landed, we quickly checked into our hotel and went all over the city. I was ready to go back to the hotel around 10 (we hadn''t slept in over 24 hours since we left for Paris right after work!) and D said he had one last surprise. We went to the top of the Eiffel Tower right before it closed and after taking in the beautiful night-time view of the city, he dropped to one knee and presented me with the tattered, wrapped ring box that he''d been carrying in his pocket every day for over 2 months. He told me how much he loved me and I said the same and we were both in tears. Then we walked back to our hotel and finally slept!!! Everytime I see a picture of the Eiffel Tower those feelings come rushing back. My friend''s proposal: Her boyfriend put so much thought into it! He''d suggested they take sailing lessons during the summer, so they did. After a few months of lessons they got a certification which allowed them to sail on their own. That fall (after the lessons were over) the boyfriend chartered a sailboat and they sailed to Martha''s Vineyard and Nantucket, where he proposed on a beach that was very sentimental to them. They were married on that same Nantucket beach a year later. Proposals don''t have to be expensive, but I can''t help but love a proposal where so much thought was put into it (like my friend''s proposal). 11.50 pm: I had spent all day wrapping xmas presents while FI slept (he had been up all night because he couldn't sleep), and was sitting on our sofa in PJs, no make up - hadn't even brushed my hair - and was reading Pokey's proposal story from PS out to FI and showing him pics of the ring. 11.55pm: 3 films are about to start - Rob Roy, Love Actually and Jaws. I want to watch Jaws, but FI is adamant about Love Actually. 12.00 midnight: FI suggests that I should eat the last truffle in the calendar and hands me the little drawer. As I take the chocolate out, there is something glinting underneath. It's a small gold ingot about 1" x 0.5", with a 'W' and a tiny number '4' embossed on it. At this point I was looking rather confused, so FI suggested that I looked in the other drawers of the advent calendar where I found more ingots - AEILLMMORRUYY. Since my FI had spent the last 6 months convincing me and all our friends that he was completely against marriage in everyway, I tried every possible way to make it say 'MERRY CHRISTMAS'. FI then suggest that I go and look in our bedroom. There on our bed was a beautiful wooden and 22ct gold Scrabble set that was produced as a limited edition back in 1994. All the other ingots were arranged on the board in the shape of a ring. Six months of planning and misleading me led to one of the greatest and best surprises of my life and the most perfect proposal I could have ever thought of... even better, we are both board game fanatics and I now have a great memento of the proposal that we can use. Through a number of brilliant tactics involving psychological manipulation and misidrection, I managed to convince her that it was her idea to go to the Metropolitan Museum of Art and her idea to rent bikes immediately afterwards in the park. I steered us into the park and as we "wandered" through the park, we "happened upon" Turtle Pond, the site of a remote controlled boat scene years earlier. At this point, she, of her own volition says "Hey, it's Turtle Pond, remember the boats we played with here" and walks over onto the rock by the pond. Inconspicuously waiting on the rock was a guy I hired on Craigslist, who I'd rehearsed the plan with the day before while she thought I was playing golf. I had gotten one of the boats back from my secretary (she has young kids and we figured they'd appreciate them more than us) and I had given it to the guy on Saturday. After a sufficient amount of mushy reminicing (all of which, mind you, appears totally organic since we happened upon a site we'd been to three months into our relationship and hadn't thought of for years) I gave the guy a signal and he motored the little boat over to us with a decoy ring box in it. After initially expressing disapproval at me taking someone else's boat out of the pond, she saw the ring box and went into some kind of shock. She wouldn't take her eyes off the ring box, so I had to pull a "Hey, I wonder who was controlling it?" to make her quickly look away so that I could switch it with the real one that had been in my pocket. Mushy speech, down on one knee, "will you marry me," etc etc etc. She loved the ring and said it was so much better than anything she was picturing. We actually did end up renting bikes (yes, she's that cool) and when we left the park I had a limo with champagne waiting to take us to Peter Luger's in Great Neck, Long Island because it's her favorite restaurant and the one in Brooklyn was all booked for Father's Day. If you've never been to New York, it's a really famous steakhouse that lists nothing on the menu but steak, spinach, potatoes and bacon. We had the steak for two for dinner and the steak for one for dessert. Then on the way home, I had arranged for this strange rainbow light sculpture thing on the top of our building to be set onto static green so that when we came down 2nd Avenue she would see a big green light welcoming her home. The next time the Empire State Building was going to be green is in August sometime and I couldn't wait that long. We live in Sydney, Australia, and drove 13 hours north to reach the sunny Sunshine Coast. After chilling out in the surf and sunbaking, we collapsed back at the hotel. My girlfriend Mira had always been a fan of the TV show "Who Wants to Be a Millionaire", so having no energy to do anything else, I said "who wants to play ''Who wants to be a millionaire''?" She excitedly said "How? ", so I grabbed the remote control for the hotel TV and switched on the TV. Whilst the TV picture was coming on, she said "but it''s on Monday night, not now". The show''s intro started nonetheless. "Wow" she said. Little did she know things had been going on behind the scene. You see, I''d been to the "Who Wants to Be A Millionaire" website and ripped off their online version of the TV game. I modified it to look like the start of the TV show and customized the gameplay for my purpose. I put questions in there that were not too easy but not too hard either, and instead of monetary prizes, I had loving surprises which would only be revealed when she answered their question correctly. I had the game running on my laptop, secretly hidden behind the television and I had a cordless mouse hidden in my pocket for control. The intro finished, and to her surprise a game screen came up. "What''s this? - how do I play?" she excitedly demanded. I wish I''d taken a photo of us in the hotel room with the TV, but it was the last thing on my mind. I then took the role of the host of the Australian version of the show, ''Eddy'', (who is relatively easy to impersonate), and announced the first question. She immediately said "Lock in answer B" - I clicked the appropriate mouse button sequence in my pocket, answer B highlighted and the familiar "correct" sound was heard. She had won her first prize, a loving hug. But she could only have it if she quit now or chose to continue answering questions until she''d passed the first safe level, question #5. She decided to continue, and she continued answering correctly and had the surprizes revealed to her along the way. She answered #5 correctly and was jubilant in knowing she''s secured those prizes. She went to continue, but the familiar "end of show" horn sounded and I informed her the show would continue tomorrow. Next night - "When are we playing Millionaire?" she asked hopping up and down. "It''s on at 7.30 - in 10 minutes" I responded. Soon we were back in action, she answered the next question correctly, but got stumped on #7. "Do I get my lifelines?". "Of course". These are the 3 second chance ''cards'' the show gives, allowing her to narrow the answer choices from 4 to 2, ask the audience for their opinion, or finally phone a (intelligent) friend. She asked the audience''s opinion, I displayed what they all said, and she went with their choice. She sighed when she heard the ''correct'' sound. She moved on, used another lifeline and continued to reveal the prizes that she''d might be winning. She finally secured those prizes and then reached the second last question. It was a toughy, a question dealing with a piece of mountaineering equipment - very foreign to her. I relied totally on her ringing her best friend Frankie (an outdoor girl) for help. But somehow Mira started to mumble the right answer, but I really wanted her to ring her friend, so I started to point out what happens if she''s wrong. She caved in and rang Frankie. Frankie confirmed her choice, it was correct and I informed her that the prize, "Something Warm", was hiding in the wardrobe. She rushed over and discovered this coat that she''d dreamed of owning, one that Frankie had secretly told me about weeks before. She was still on the phone to Frankie when she saw it. Her softly spoken words: "f###, ........... Frankie..., it''s that... that brown coat". It couldn''t have gone better to plan. After 10 minutes, Mira calmed down and asked, "There''s a final prize? What is it? A car?" "Let''s see". We went to play on but the "end of show" horn sounded. The next day we checked into a beautiful bed & breakfast getaway retreat in the mountains run by a Japanese couple - it was exactly the style we appreciate, incense, shiatsu, no TV. The next morning just before checking out to head back home, I said "ah, we forgot to finish Millionaire last night". Mira said "but there''s no TV here". I said "we don''t need it - come outside"
We went out to the backyard which overlooked the valley and hills, sun still breakfasting on the morning''s fog. I had ''installed'' the male host at a secret window with a camera with a big zoom lens and the hostess collected a fresh bouquet of flowers from her garden for me. I had Mira close her eyes and I handed her the bouquet. I said "The final, million dollar question is.." - I knelt down, flipped open a box revealing a diamond begging for attention and continued "will you marry me?". We had the diamond mounted in a ring handmade by Mira''s family jeweler. D and I had bought our ring in July but he told me that it would be the end of the year before he proposed so I was thinking it would be around my birthday in December then. He told me late September that he was going to take me away for a weekend in October so I thought that it might be then but he was so convincing that it wouldn''t be so I thought nothing more of it. He wouldn''t tell me where we were going and not even if it was somewhere in Ireland(where we live) or somewhere european so I decided to call his bluff and say that I wasn''t going to bring my passport so he had to tell me it was abroad Yes I''m a big kid! Her birthday was last week, and as part of her gift I got her a massage at Ettore spa in Center City Philadelphia. We were intending to go to a Winery Grand Opening above New Hope afterwards, so I drove her to the spa and said I would just hang out in Starbucks for the hour. I had worked all this out with the spa ahead of time so they played it cool all day. They had her get in a robe and slippers after the massage to relax with a mimosa. (she thought it a little odd she had to put on a robe to do this) They then informed her after the mimosa that she would be spending the rest of the day with them. She then got an hour long facial, an hour manicure, hour pedicure. While this was going on.. I went home and picked up her outfit and stuff for the next morning etc (she would have noticed if some of the stuff was missing that morning), I checked into the Lowes Hotel and got a corner suite with an awesome city view (I have a friend thats a manager there). I decorated the room with 250 roses, some in 6 vases around the room, some on window sills, some on top of the end tables, bathroom sink, tub, chairs, pictures etc. I "paved" a path from the door to a chair by the corner window with roses, tea candles and petals. I placed a radio with my Ipod playing softly hidden in a corner with a small play list I prepared. I gave her a kiss and we got a cab to the Bellevue Hotel and took her to the 19th floor. We ate dinner at XIX www.nineteenrestaurant.com , and had some cocktails. She admitted she thought it was coming right here.... but I said I hoped you liked your birthday surpise, but we better get home to see the game(PSU vs. OSU). We took a cab back to the Loews Hotel I told her I parked there. While walking through I said lets see if Alex (our friend) was working. I gave him a call and had a fake convo with him. This was his cue to light all the candles in the room. He came down and met us in the lobby and asked Meg how she liked her "birthday" surprise, at this point she was totally thrown off. He suggested we go upstairs and check out the view of the city, it was awesome tonight with the near full moon and clear skies. We said OK and since we have done this several times before she thought nothing of it. I even pretended I didn''t know where the room was right away when we got off the elevator. It went perfectly... the spa staff was amazing. She said the spa was buzzing with talk of her "surprise" and customers and staff were talking to her all day about it. With the help of Alex I was able to keep her from really being sure this was it untill the last second. We both woke before sunrise the next morning because we were so excited, which worked out awesome because we took pictures of the sunrise and the refection of it off the mirrored glass buildings in the skyline. We ordered some room service and relaxed before meeting our parents for lunch. Yay, I feel like I contributed something! This story isn''t MINE, because I''m neither married nor engaged, but it is the best proposal I''ve ever heard (although some one here are just WOW!). The sweetest thing I''ve ever heard of was done by my friend. He bought a fabric daisy from a craft store and cut the petals off, then placed the petals into a small wooden box - making sure that there were an EVEN number of petals in the box. He then printed a card that said "Remember that childhood game ''He loves me, he loves me not? Now you can play it again! Pick up a petal and say "He loves me! ", then pick up the next one and say, "He loves me not!" and continue until the petals are all gone. What did you end on? That''s your love fortune!" (or something like that). He put the card in the box and had the whole thing shrinkwrapped and even took a price sticker off something else and put it on the box, so it looked like something he bought at the store. All in all it was pretty cheap to do, under $10. Then he gave it to her, acting like it was some silly thing he found at the store that he thought she''d like. When she opened it, she played the game and, since there were an even number of petals, ended on "He loves me not!" She was sad until he pulled out another petal from his pocket and said, "Don''t be too sure!" 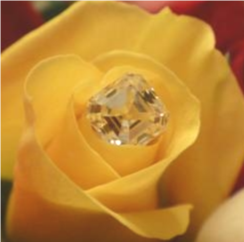 The last "he loves me" petal was glued to the top of the ring box. During the summer, we picnic fairly often. DH and I had already picked out the ring together, and I knew the proposal was coming any day. The proposal was very us - laid back, casual, but full of meaning for both of us. ...In the morning, he asked me to meet me on the university quad after my class for a picnic lunch. This was not something very out of the ordinary. Typically, the quad is very deserted in the afternoons during the summer, since my university offered few summer courses, so it was a really calm, beautiful place to meet. When I arrived after class, he had his shoes kicked off and had already arranged a spread of picnic foods that I like (well, minus a container of raspberries which are his favorite...he got peaches for me). The blanket was all lumpy, so I jokingly patted down the lumps looking for the ring box. Finding none, I settled down and we ate lunch and talked, and watched as the new freshman students walked by with their parents for orientation. The spot he chose was gorgeous - it was right in front of my favorite building on campus, which is where my parents met more than 30 years ago. The second all the students walked on, he brought up the beginning of our relationship and how he''d felt about me when we first met (I kept interjecting, laughing about the funny and less romantic times we''d shared at those intervals). Then, after a few minutes, he said "hold on, I need to stretch," and reached into his shoe for the ring box. Down on both knees, he crouched in front of me and clasped my hands around the box. He told me he wanted to spend the rest of his life with me and asked me to do the same. I was so surprised and happy and started crying and said "YES!!" before opening the box to reveal the beautiful ring. Okay, I''ll share my dream proposal too. This is for anyone looking for an idea in Seattle! When my BF and I first started dating, we went on vacation to Seattle. One of the restaurants we ate at was the revolving restaurant at the Space Needle. The food was okay, but it was really the view of Seattle and the sound over sunset that was just amazing. And the dessert I had was spectacular - it was an ice cream sundae that was placed on a stand so it was like two feet high - and within the stand was dry ice, so steam was just flowing everywhere! I want to say it even had sparklers on top of it, but I think that part is just my imagination running wild. Anyway, ice cream is my favorite food and the presentation was just completely spectacular, so I''ve always thought that would be a FANTASTIC way to propose. Pandora posted my millionaire proposal above (I'm flattered you remembered it! ), but one of my favorites was the guy who took his girl fishing and during, secretly swapped her line with one that was baited with a diamond-looking door knob mounted on a brass door knocker ring (he must have worked in a door shop). When she eventually pulled it up to see if the bait was still on, of course he had to deliver the "catch of my life" line. I''m not engaged but here is my friend''s proposal story! Saturday June 30th P and I had planned to go out to a nice restaurant. With all the weddings and different events that had happened in the past two months we hadn''t had a lot of alone time and thought it would be nice to have a date night. P had made the reservation and we were going to take a walk through the park beforehand. He came home in the afternoon (I thought he was home from work), then we relaxed for a while. We got ready for dinner and he insisted on wearing a dinner jacket. Most of you know that P is not a dinner jacket kinda guy, so I couldn''t understand why he needed to wear a jacket. He kept saying he wanted to be "more metrosexual". I thought he was crazy, but I let him go ahead with the jacket. He sweated profusely the entire 85+ degree subway ride to Central Park. here is a pic of the proposal! I love reading all of the stories. Mine''s already on here but I''ll write it again. My FI and I had just been to a concert near Boston and on the way home, he suggested we drive to my favorite lighthouse in Maine. It was a great idea but it was late by that point and I was tired. I really wanted to go though so I agree. We stopped by our house on the way to Maine to check on the cats and pack in case we decided to stay somewhere. We got to the lighthouse around midnight or 1:00 in the morning and walked on the rocks above the water. It was pitch black and it was freezing (it was early May but it''s still chilly up there at that time of the year). My FI then ran to the car to "get his jacket" and then he called me over to him to "look at the lighthouse" or something. He left his lights on so I could see. We stared out at the water and listened to the waves for a minute more and while I looked away, my FI had taken the ring out of his pocket. He said my name to get my attention and when I looked, he had the ring box open. He said, "if you''ll have me, I''d love to be your husband." There was no big speech or anything but it was still great. I loved that my FI used that line because back when we had been dating somewhat casually, he decided that he wanted to make it official and more serious. At that time, he had said, "if you''ll still have me, I''d love to be your boyfriend." I loved that he chose to use almost the exact words he had spoken 4 years ago. Oh, and here''s where we got engaged. The lighthouse is actually on a small island. The photo (which was not taken by me) is taken from the park across the way. There are a bunch of rocks that lead down to the water on the park side. There''s also a little garden and a great place to lounge on the grass and listen to the waves. I love this place. DH & I met on the internet because we were both fans of the same hockey team. I only went on our first date because he had tickets to a game, and ?I figured, "hey, even if the guys a shmo, at least I got free tickets". But then we fell in love! That year, our team won the Stanley Cup, so we decided to go up to the hockey hall of fame and see the cup. It''s a fun place, you get to play games like announcing plays on a screen, pretending to be goalie, shooting at a goal, etc. And when you get to the top floor, there is THE STANLEY CUP! So we went up to get our picture taken with it (hockey fans know and understand the holy grail...) He got on one knee and proposed. It was so cute and so perfect and so US! And the best part was, his BIL & sister were there and they videotaped the whole thing!! Pricescopers, you will appreciate this. I was so STUNNED (we had never even TALKED of a proposal) that I grabbed the ring box from him and walked away! LOL! HAHAHA! FI and I are HUGE Red Sox fans and went to Fenway Park to watch a game while we were visiting my family in Massachusetts. We got there and were totally in awe of the whole place. After the game started, my aunt had me come off to the side with her and she told me about how she knew one of the ushers and about how he was going to have us come down to the dugout at the end of the 4th inning so that FI could get an autograph from one of the players.. So the bottom of the 4th inning rolled around and we went down the stairs. I was a little confused and said, "I don''t know where we''re going.." She insisted that I went first. We got down to the bottom of the stairs and went and stood in a section right above the Red Sox dugout. We were standing there and I was still extremely confused about what we should be doing.. So then FI came over and grabbed my hand and was pulling the ring off of my finger. Then I said, "Honey, what are you doing?" He kept pulling on my finger and I repeated my question. Then I kinda motioned that he was pulling the ring off of the wrong finger. So he pulled the ring off of my left hand and proceeded to put it in his pocket.. Then he grabbed both of my hands and started to tell me a bunch of really sweet stuff.. After that he looked over at the big screen and told me to wait a second and then there would be something on the screen.. So we waited for what truly felt like FOREVER. Then the screen said "Heather, will you marry me?" He got down on one knee, opened the box and asked me.. I said yes and nodded.. Then got up and put the ring on my finger.. The entire time, my aunt was standing next to us taking pictures with both of our cameras.. AND recorded a video! The best part of the video is when you can see a guy walk by and hear him ask my aunt, "Is he asking her to marry him?" My aunt responds, "Yeah". And then the guy says "That''s AWESOME!" It''s priceless. The whole thing was absolutely perfect in every way! It was at the end of our first day of vacation in Paris. We''re laying in bed while I looked at the tour book, droning on about what we were going to do the next day. He''s laying next to me, apparently having an internal meltdown. I had just ruined his plans by announcing that no, I''m not going to shower right now, I''d do it after dinner. He had been planning for months. He had hidden flowers and champagne in the room and was going to set up a romantic scene while I showered. Then we''d go to dinner to celebrate. But when I said I was just going to shower after dinner his brain began to malfunction--from nervousness, excitement, and probably jetlag. So I''m reading out loud from the guide book when he blurts out "Will you marry me?" It was a total surprise and a completely unromantic moment so I thought he was kidding. "Are you being serious" I asked. He confirmed that yes, he was being serious and started saying all the expected mushy stuff--he loves me so much, be together forever, etc. So I''m all shocked and ecstatic and after a few minutes of snuggling and cooing he sits up and says "Oh yeah, I forgot. The ring. You might like this." Then he goes to his bag and pulls it out. Better late than never! He told me about all his planning of the ring and proposal over the last few months and how the no shower before dinner threw him off and he just couldn''t hold it in anymore. Once we came down from the initial high he was horrified at how unsmooth he was--I like to sometimes tease him about it too but I love it because that''s who he is. He''s not a smooth operator and I couldn''t imagine him or our proposal being any other way. I was planning on asking her on New Year''s Eve, but I couldn''t wait that long! So I asked her on our 11 year and 5 month anniversary. We''ve both waited long enough! I set up the computer so a screensaver would pop up saying "Look underneath the keyboard for a surprise!". I also set it up to play an MP3 of "Only One" by Yellowcard. I stashed a card underneath the keyboard. It looked like a regular anniversary card with the exception of my proposal in the end. At the moment she read my proposal, I surprised her with the ring, and a few tears later, we were engaged! My now fiance (and very soon to be husband! )picked me up for a weekend trip to celebrate our 4 year anniversary. We drove back to the town where I was going to college when we met. At this point I was pretty sure what was going to happen. There was a nearby national park where we went on our first date. Since it was March 1 when we first met 4 years ago the lake had been frozen over and we were young and stupid enough to be out walking on it and writing ridiculous things in the snow. So when we returned for our anniversary my fiance took me out on the dock where we had our first kiss and he had written in the snow on the ice "Will you marry me?" in french (a language I had studied and he needed to look up). I was so shocked at his romantic proposal I almost forgot to say yes! After I accepted his proposal we went out to dinner with my best friend from college with whom he had arranged would be in town to celebrate with us. I''m so excited to marry this wonderful man on March 1, 2008 (our 5 year anniversary)! My birthday is Christmas Eve. She''s probably expecting Christmas. But I''m going to ask her to marry me for my birthday, after she''s taken me out and shown me a good time. my now-FI asked if i wanted to go on a winter walk (we take a lot of walks) to see some christmas lights one nite. when we got back he made me hot chocolate and i lit some candles (coincidentally!) and we just sat by the christmas lights and snuggled for a few. he said he wanted to read, which we do pretty often, so i said that the book (that we were currently in the middle of) was in my room and he said that he had gotten a new one that he wanted to start. so he pulls out one of his stupid dragonlance books that he used to read in middle school and asked if i would please read it with him (which is something he had tried to get me to do before). after rolling my eyes i agreed, and after a few pages he popcorned me and it was my turn to read aloud. like two pages into my turn i turn the page and there is a hole cut out of the book, and there was the ring! he got down on his knees (i was on the couch) and told me that every day he finds out more to love (or something like that, it was hard to pay attention!) and asked if i would marry him! it was very private and very sweet and really personal. when he came home friday night he reminded me that we were going christmas shopping downtown saturday, and i was like ok fine. saturday comes, and i still had a little hope up until when he came to pick me up and there was no sign of a ring box in any of his pockets...at this point i just wanted to get over with this day. we finally get down town, me M and my sister. and as we were passing by one of my favorite churches, and gardens in chicago, i mention it to him, his response was not to great. we start our shopping and i get pissy from the get go becasue there are soooooo many people in the mall, after an hour i just wanted to go home. my sister still had 2 gifts to get so i was like well just go to H&M now, but she really wanted to get chocolate from Ethals before lunch for some off reason, and boy was she persistant on getting that stupid chocolate. so i gave in becasue iw as tired, and feeling hungry and i wanted to get home. so were walking to bloomingdales to get her chocolate, and on the way we pass by that garden and M was like lets go look i was like ok what ever so we go inside, and i was like if hes doing it ill see a photographer or my sister will pull out her camera...neither happend. so as were walking through he stops in the middle and he had a look in his eye, that "are you ready" look...once i realized what he was about to do the first words out of my mouth were "SHUT UP...SHUT UP..SHUT UP.SHUT UP!!!" i know that was sweet no? what i didnt know was that a friend of mine from highschool, whose a professional photographer was taking pictures of the whole thing!!! My gf bought us tickets to the Philharmonic concert series- incredible seats- and so every week we''d go to a concert. The last flower delivery corresponded with her twin sister''s wedding. The twin knew it was coming- and I had briefly considered having the ring with me at the wedding just in case (as it was my gf caught the bouquet and I caught the garter...), but it just wasn''t the right moment. Proposal - 8 months: The first flower delivered. Proposal - 3 months: A couple of calls to our favorite winery- and they''re willing to help me propose. Proposal - 1 week: Final ring inspection. Proposal - 2 day: Ring picked up. Proposal day: I knew the winery route by heart having done it many different years. I kept us on a relaxed schedule, only certainty I had was to be at my targeted winery by 1230pm. Her twin sister and husband accompanied us- lots of wine tasting was had by all. I had an excuse to take my camera with me as well- the fingerlakes region is beautiful. When we arrive at the winery there''s a section covered in cloth. We have a wonderful wine tasting with happy, smiling staff.... and then just as a tour bus starts unloading with 50 people (yay for me) they pull the cloth off. Twin''s Husband looks up and says "GF, isn''t that you??". Little poetry, little knee bending, and I''ve got a fiancée! See the photos for the whole sequence. I had a similar proposal as NewEnglandLady''s! BTW, I''ve been lurking for a bit and love this site! This is my first post! Yay! First off, my bf accidently screwed up his vacation schedule, so we were unable to go to our planned destination for my winter vacation. We ended up planning for Paris on the fly for the only four nights he had available and right before I had to go back to grad school. On the next to the last day in Paris, after having walked all over Paris, we came upon the Eiffel Tower. It is absolutely gorgeous at night. Plus, when we got there it started to sparkle! We were pretty much the only people in the park, since it was chilly and muddy. I could tell he was really nervous and instead of directly asking me to marry him, he asked me for a favor! He pulled out a folded up tissue from his pocket and told me to open it. The ring was wrapped up in the tissue the whole day! Although the proposal wasn''t completely a surprise (since my bf [now fiancee- whoo!] tends to accidently give hints when he''s excited), I can tell my friends, family, and future children about his Parisian proposal! Went on a 4 night cruise to Bahamas. She was hoping but not expecting. We were together for 7 years before I asked her. Asked her, privately, at the end of the beach on part of Grand Bahama Island. We were right off the beach on the rock jetties, asked her to stand above me so I could take a pic, pulled out a ring with the camera. This happened to someone I know. I''m sure I can''t relay the story as amazingly as it was, but I''ll give the gist. After walking around and looking at everything, they got to a display case with a beautiful ring in it. It was in the box, opened up, with a plaque beside it... "_______, will you marry me?" it said. She looked at it and went "Oh wow, that girl has the same name as me!" When she turned around, the boyfriend was on one knee and her entire family came out from different parts of the gallery and he proposed. Couldn''t be more perfect in my books.